We really hoped for it but we certainly didn’t expect it! 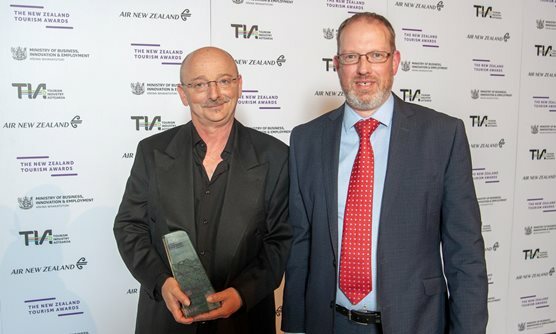 Last night, Owen River Lodge became the first fishing lodge in the country to win at the New Zealand Tourism Awards. I accepted the 2018 Westpac Business Excellence Award on behalf of the ORL team at a black tie dinner held at Christchurch’s Air Force Museum. The award is open to New Zealand tourism businesses with less than $6m annual turnover. Owen River Lodge is a brilliant example of a luxury business delivering an exceptional customer experience across food and beverage, accommodation and guided fishing. It is a role model for tourism businesses everywhere and demonstrates the benefits of high value tourism to a small rural community. Although other fishing lodges have made the finals in previous years, none of them have been able to crack the awards—until now. The competition was very stiff and, right up until the announcement, we honestly didn’t think we’d win. Even though we’re thrilled and feel justified in blowing our own trumpet a little, we’re very aware that many factors have contributed to this success. The award truly belongs to Owen River Lodge’s team of outstanding fishing guides, superb chefs and amazing housekeeping staff. Every one of these people has remained committed to the highest standard of excellence, every season—with the result that we’re now an overnight sensation, 15 years in the making! We also share this award with our wonderful guests. Their honesty and generous feedback has provided our motivation, our inspiration, and the standard to which we’ve always aspired. So thank you, everyone, from the bottom of our hearts. We open for the new season on 1 October and it’s now back to business as usual. Bookings are phenomenal this year but there’s still room to welcome back old friends and greet the new. Here’s to a sensational season!